The Portland offense rolled with four runs in the fifth, three in the sixth and one more in the seventh to run away from Richmond. Ryan Court and Danny Bethea led the charge with identical 3-for-5 days, each doubling and driving home a run. Cody Decker chipped in two hits, including a two-run single. The only Sea Dog not to register a hit, Andrew Benintendi, made his mark with a walk and a sacrifice fly. Teddy Stankiewicz struggled a little, allowing four runs in five innings, but relievers Ty Buttrey and Taylor Grover allowed only a single tally in the final four innings. Yoan Moncada returned to the Salem lineup with a bang, blasting a go-ahead home run in the eighth inning. After wear and tear kept him from the lineup for a few days, the Red Sox top prospect went 2 for 4 with a double, a home run and both of Salem’s runs. He was then rewarded with a promotion to Double-A Portland after the game. Mike Meyers and Rafael Devers each knocked two base hits, including Meyer’s first-inning RBI single, while the Salem pitching staff held the Dash at bay all night. Matt Kent tossed six scoreless innings to start, and Mario Alcantara, Simon Mercedes and Bobby Poyner each took an inning of relief. Winston-Salem’s only run came on a wild pitch by Alcantara in the seventh. After the game, Salem announced the promotion of Moncada as well as pitchers Jalen Beeks and Ben Taylor. Drive leadoff hitter Chad De La Guerra was in the middle of all three of the team’s runs Sunday, as the team jumped to a 3-0 lead and hung on for a 3-2 victory. De La Guerra put the Drive on the board with a solo shot in the third inning, his first of the season. Then in the fifth, he was at the dish when a passed ball scored Derek Miller, and De La Guerra finished the at-bat with a sacrifice fly to score Austin Davidson. Dedgar Jimenez was terrific on the mound for Greenville. He struck out seven in six innings and allowed only a solo home run in the sixth. Anyelo Leclerc nailed down the one-run win with a four-out save, his eighth of the year. Eight different Spinners accounted for the team’s eight runs Sunday, as Lowell blew away Williamsport to improve to 3-0 on the young season. The game was scoreless through five innings before the Spinners exploded for three runs in both the sixth and seventh and two in the eighth. Two members of the 2016 draft class, Ryan Scott and Nick Lovullo, picked up hits in their professional debuts, while Jerry Downs’ three-run triple and Carlos Tovar’s three hits led the offense. Enmanuel De Jesus was brilliant in his first start of the year, throwing 6 2/3 innings of shutout ball. Williamsports’ lone run came on a ninth-inning single off Brad Stone. 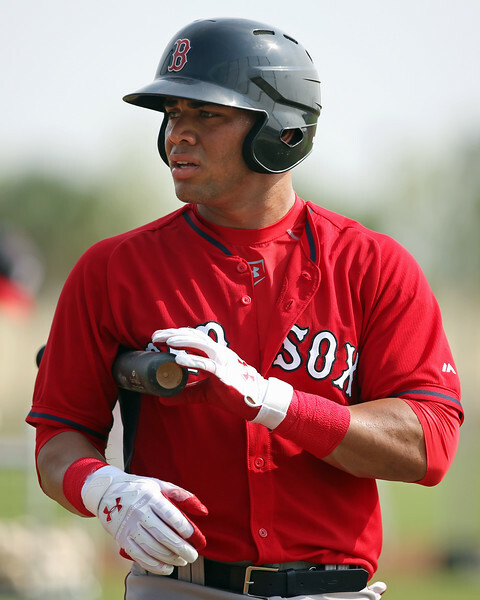 Player of the Night: The Salem Red Sox were happy to have Yoan Moncada back in the lineup Sunday, even if his return was short-lived. Moncada blasted his 25th double and fourth home run of the season in the 2-1 win, pushing his season line to .307/.427/.496 through 61 games. Moncada’s All-Star first half earned him a promotion to Portland Sunday, 13 months after his professional debut.